In patients with acute myocardial infarction (MI), BMI < 18.5 kg/m2 and a decrease in BMI during follow-up have been associated with poor prognosis. For BMI ≥ 25 kg/m2, an “obesity paradox” has been suggested. Recently, high visit-to-visit BMI variability has also been associated with poor prognosis in patients with coronary artery disease. To simultaneously evaluate several BMI measurements and study their association with cardiovascular (CV) outcomes in a large cohort of patients with acute myocardial infarction (MI) and left ventricular (LV) systolic dysfunction, heart failure (HF) or both. The high-risk MI dataset is pooled from four trials: CAPRICORN, EPHESUS, OPTIMAAL and VALIANT. Mean BMI, change from baseline, and variability were assessed during follow-up. The primary outcome was CV death. Cox-proportional hazard models were performed to study the association between the various BMI parameters and outcomes (median follow-up = 1.8 years). A total of 12,719 patients were included (72% male, mean age 65 ± 11 years). Mean, change and visit-to-visit variability in BMI had a non-linear association with CV death (P < 0.001). Mean BMI < 26 kg/m2 (vs. ≥ 26–35 kg/m2) and BMI decrease during follow-up were independently associated with CV death (adjusted HR 1.32, 95% CI 1.16–1.51, P < 0.001 and adjusted HR 1.57, 95% CI 1.40–1.76, P < 0.001, respectively). 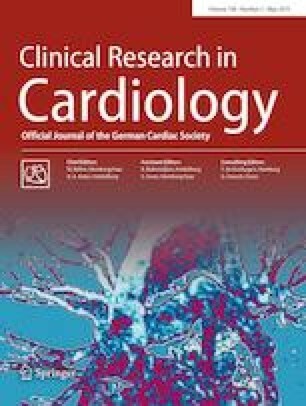 Low and high BMI variability (< 2% and > 4%) were associated with increased event-rates, but lost statistical significance in sensitivity analysis including patients with ≥ 5 measurements or excluding patients with HF hospitalization, suggesting that BMI variability may be particularly associated with HF hospitalizations. Mean BMI < 26 kg/m2 and a BMI decrease during follow-up were independently associated with CV death in patients with MI and LV systolic dysfunction, HF or both. These associations likely reflect poorer patient status and causality cannot be inferred. All authors are members of the High-Risk Myocardial Infarction Database Initiative. The online version of this article ( https://doi.org/10.1007/s00392-019-01453-7) contains supplementary material, which is available to authorized users. The authors thank Pierre Pothier for editing the manuscript. SS, JF, NG, PR were supported by a Contrat de Plan Etat Lorraine, FEDER, and a public grant overseen by the French National Research Agency (ANR) as part of the second “Investissements d’Avenir” program (reference: ANR-15-RHU-0004), and GEENAGE Impact Lorraine Université d’Excellence—reference ANR-15-IDEX-04-LUE.